Marga Gomez, the grinning, gap-toothed Latina lesbian performance artist, arrived in Santa Fe to show her roots. 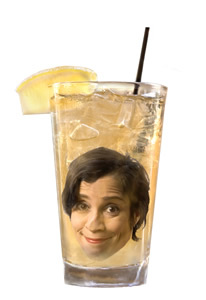 Her new “solo play”, “Long Island Iced Latina” seemed designed to mainstream herself a bit, at least in the sense that anything Hispanic trumps anything lesbian, although neither is what you would call, “mainstream”. At least Hispanic content can be marginalized on Hispanic radio, TV, etc. They’ve got numbers. Lesbian stuff—not so much, especially with the sense here in hope-filled America that there is a new, improved, church-endorsed, post-proposition-8, anti-gay resurgence. Gomez isn’t stupid. If you’re a smart-mouthed San Francisco comedienne, it makes absolutely no sense to go on tour right now with your L-world quips, not if you want to sell tickets in Des Moines. Even in Santa Fe, for that matter. Just last month in the New Mexico State Senate, the church stood up, walked all over the so-called liberal politicians of the state, and soundly destroyed a Domestic Partner referendum. It’s an exciting time all right. So here comes Marga Gomez with a narrative strategy designed to sell. Not a bad idea, if only the Latinos had bought it. At least in Santa Fe, the mainly pale-faced, Boomer audience chuckled politely at her nostalgic tales of a nice Jewish boyfriend’s attempts to get into her bloomers back in the fish-out-of-water years in suburban Long Island. Imagine how jilted the dozens of womyn in the audience at the Lensic must have felt. Indeed, this was an upscale auditorium a million miles away from the dyke clubs and smaller, edgier Mission district venues Gomez usually plays in her home town, but there was barely a lesbian punch-line for the first hour of the show. Que lastima. Finally, the moment arrived–a thematically linked remark about Gomez’ blonde girlfriend (Latinos are obsessed with blondes like Diane Sawyer, according to the comic). That was it. Until a sad-but-true riff on the fact that lesbians will pay good money to see any movie (or comic’s act) in which there is any possibility of lesbian content, no matter how long they have to wait, and how tiny the pay-off. To her credit, Gomez does know how to tell a story. She is a stand-up comic who uses a strong physicality to inhabit the space and create characterizations. She knows how to deliver a punch line. Her narrative, however, has been woven together with the skill of a writer milking every possible laugh out of every possible cliché. You get the gist after a moment: a Puerto Rican/Cuban mother moves on up to the suburbs with little Marga in tow. Wasn’t that a TV sit-com? Indeed. A comic like Margaret Cho is a lot funnier and more successful because she, as a borderline fat, bi-sexual Asian girl, has absolutely no compunction about cursing up a blue streak and alienating Republicans, straight people, conservatives, and anyone else who gets in the way of her jokes. Cho and Gomez both clearly come from a place of disenfranchisement. It’s just that Gomez seems to be a little too desperate to be loved. Like Judy Garland before she killed herself. And that’s not funny. Judging from this new piece, Gomez is marching herself out of the Castro and back in time, to a Bronx and Long Island-based Latin nostalgia loop with no possible escape. Just because she actually grew-up, and came-out, and lived a life full of funny, juicy lady-loving stories, doesn’t mean she can’t afford to talk about it outside of San Francisco. Does it?